To her first run for Congress, Kelly Westlund brought experience as an Ashland City Councilmember, executive director of the Alliance for Sustainability and as a small business owner. 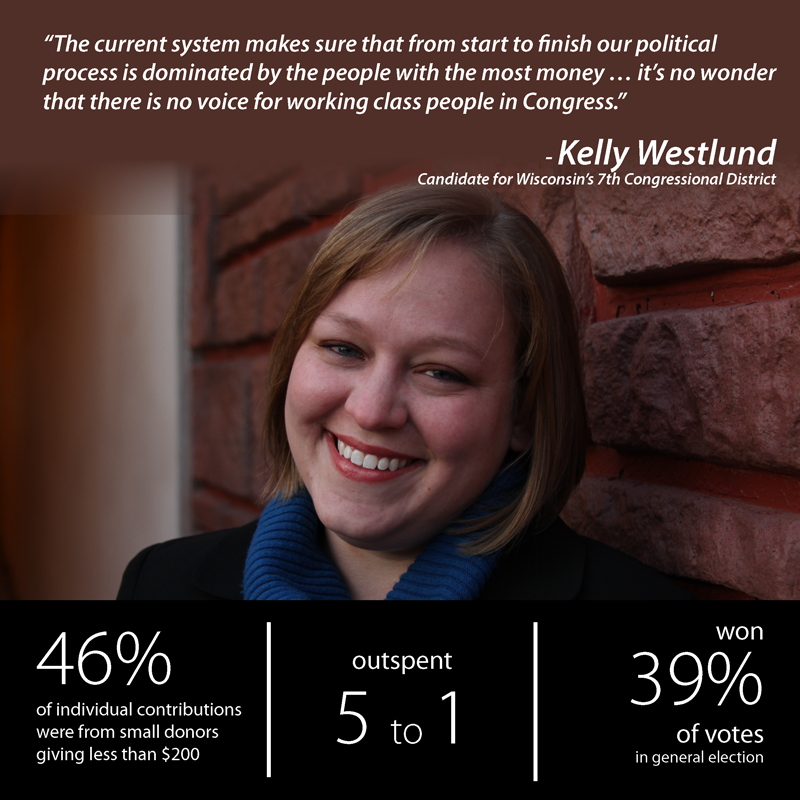 As a local elected official, Westlund saw how decisions made in other places affected her community, and when she looked at their current Representative, Sean Duffy, she thought she could do better and decided to run against him. Amanda Renteria worked as a financial analyst for Goldman Sachs and attended Harvard Business School, but she ultimately decided to shift her career path to working in government to help others. She went on to work for Senator Debbie Stabenow and became the first Latina Chief of Staff in the history of the Senate. 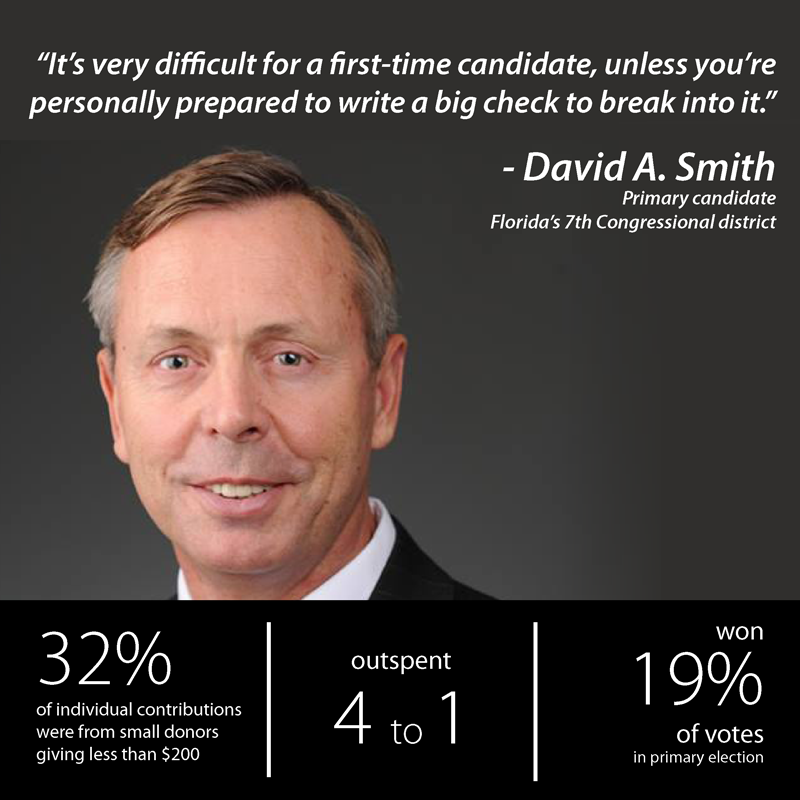 A decorated former Marine Colonel in a district with a high concentration of veterans, David A. Smith felt that veterans were underrepresented in Congress and the VA needed fixing, so he decided to throw his hat into the ring. Rev. Michael Walrond Jr., locally known as Pastor Mike, leads a congregation in Harlem committed to social justice. 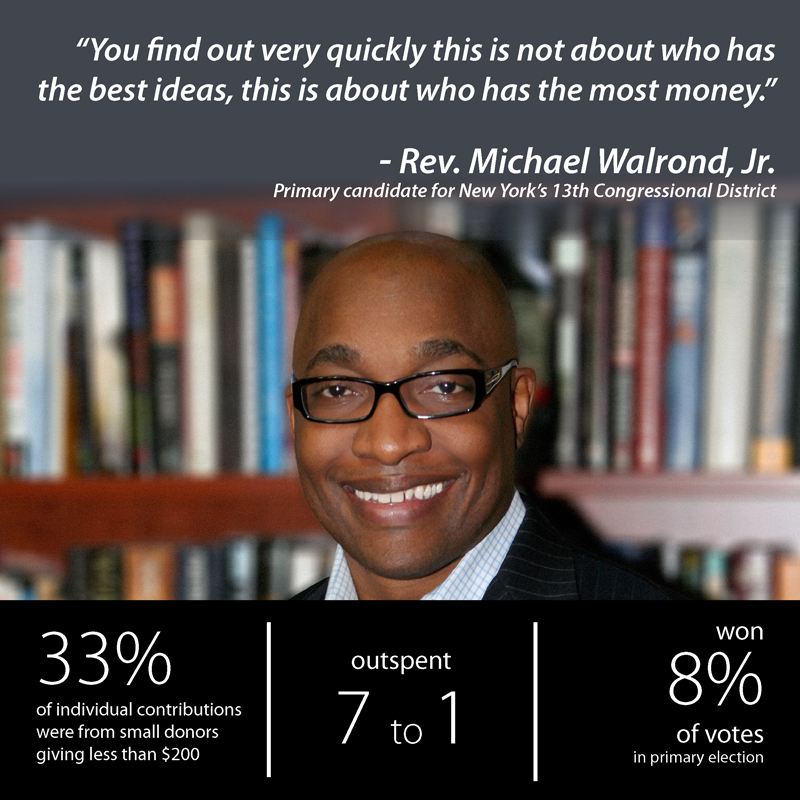 From serving his community as a pastor for ten years, Walrond heard “a tremendous amount of frustration with elected officials” and he threw his hat in the ring to show you don’t need to wait for permission from the political insiders if you have a passion to make a change. Yet he saw how big money shaped his ability to run an effective campaign and get his message out. •Candidates for the U.S. Senate must raise an average of $3,300 every day for six years to match the contributions collected by median 2014 winner; House candidates must raise $1,800 every day of their two-year cycle. •Relying exclusively on small donors, Senate candidates would have to secure at least 17 contributions every day and House candidates at least nine in order to keep up. •In 25 targeted 2014 congressional races, successful candidates and their closest competitors received more than 86 percent of the funds they raised from individuals in contributions totaling $200 or more. • Only two of 50 candidates in these competitive races raised less than 70 percent of their individual funds from large donors, while seven relied on big donors for more than 95 percent of their individual contributions. •This big money system filters out qualified, credible candidates who lack access to large donors. Four of these candidates are profiled in the pages below. •A federal program matching small contributions with limited public funds would have helped the profiled candidates compete more effectively against their big money-backed opponents by substantially narrowing the fundraising gap. One candidate would have raised significantly more money than her opponent if a matching fund program were available. The other three candidates would have narrowed the fundraising gap by an average of more than 40 percentage points. More importantly, they would have had significantly more resources to get their messages out and hit the minimum threshold for running a competitive campaign. And, they would have been able to do so raising two or three small contributions each day as opposed to the nine or more they currently need to keep up.